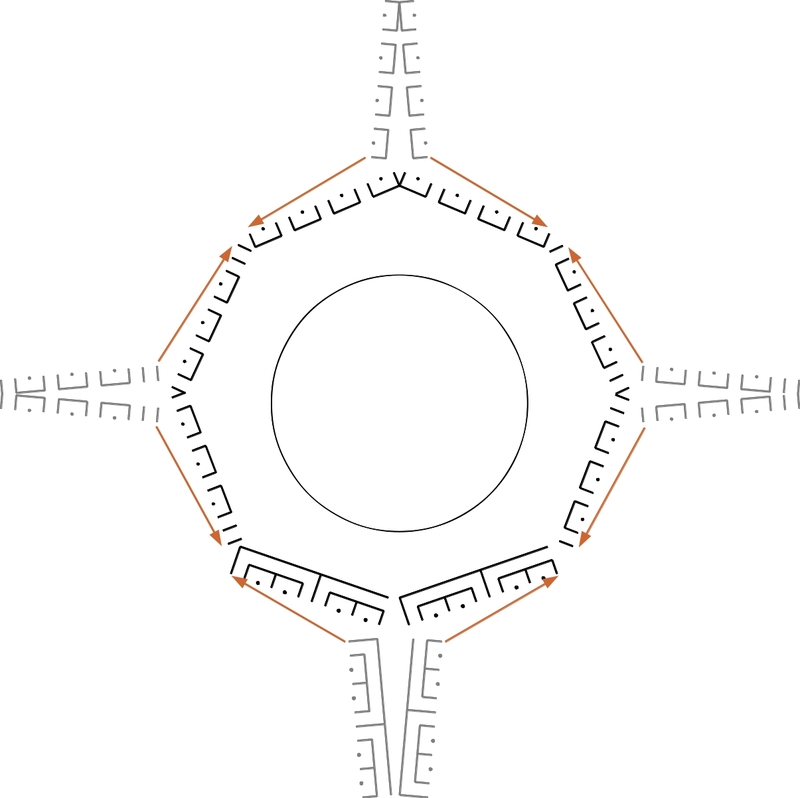 In order to transform a labyrinth with multiple arms into the Man-in-the-Maze (MiM) style, also the side-arms must be appropriately transformed (see related posts 1, below). So let us first have a look at what happens when the main axis is transformed. This can be done using the one-arm labyrinth of Heiric of Auxerre. Because this has the same seed pattern as the main axis of the Chartres type labyrinth. First, the seed pattern is obtained (fig. 1). 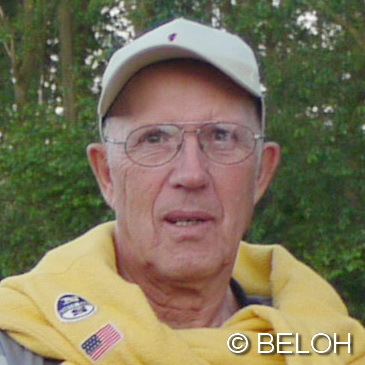 It is not important to draw an exact copy (left image). What counts is that the structure is clearly recognizable. The seed pattern consists of vertical and horizontal lines and of dots. It is aligned to the central wall delimiting the pathway (central image). The seed pattern now has to be transformed in such a way, that it fits to the auxiliary figure of the MiM-style (see related posts 2). For this purpose it has to be aligned to a circle of the auxiliary figure or, respectively, to be bent over such an auxiliary circle. The effect of this should be that the central piece of the wall delimiting the pathway lie on the auxiliary circle and the horizontal lines and dots emanate radially from the circle. For this, the seed pattern can be split along the central wall and divided into two halves (right image). Next, both halves will be bent over an auxiliary circle (fig. 2). For this, both halves are opened to a wide angle such that they can be aligned to the auxiliary circle (left image). Then they are bent over the circle and fitted together again on top (right image). Please note that for this process, two pieces of the central wall delimiting the pathway have to be prolonged (dashed lines). 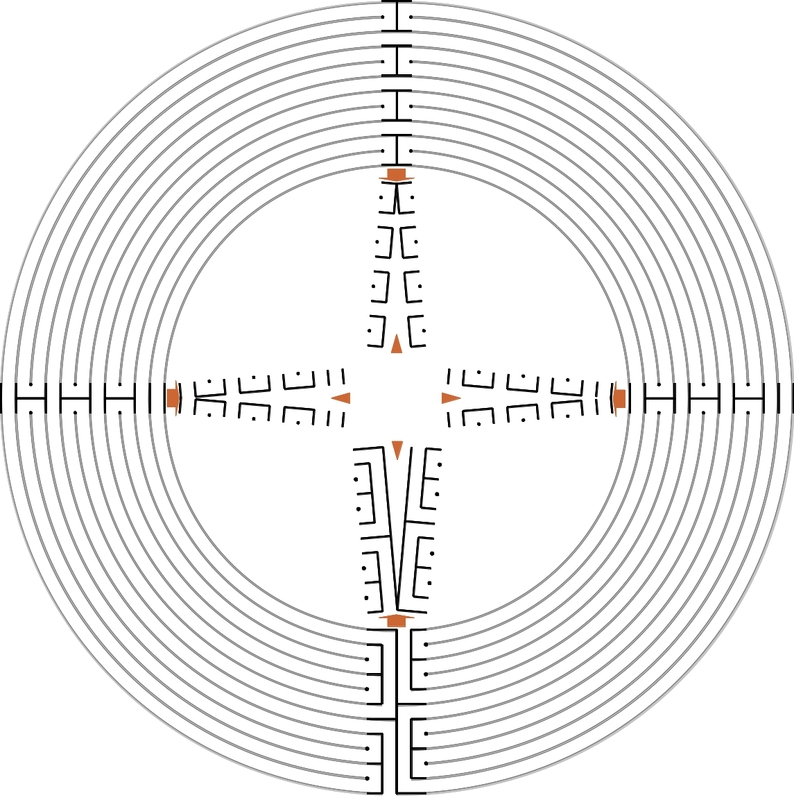 Otherwise when transforming the vertical central lines to the semi circles, two gaps on the central circle would remain, one opposite the entrance to the labyrinth and one opposite to the center. 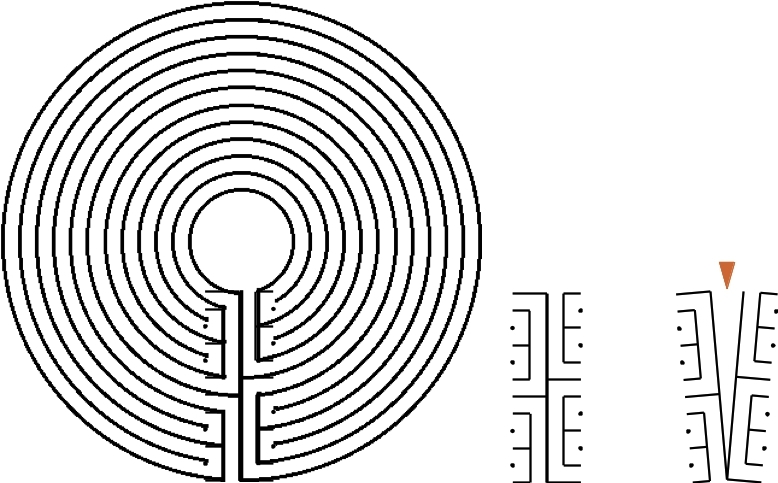 Now we apply the same procedure to the four arms of the Chartres type labyrinth (fig. 3). First we have to obtain the seed patterns of all four arms. In order to facilitate the illustration I choose a labyrinth with a strongly enlarged center and copy the seed patterns of the four arms. Then I shift each of the seed patterns towards the center. In order to transform them into the MiM-style all four seed patterns have to be aligned to one of the circles of the auxiliary figure. For this, they are split into two halves, just the same as previously twith the seed pattern of he one-arm labyrinth. In a next step the seed patterns are opened wider in such a way that they can be bent over the auxiliary circle (fig. 4). Then, all eight halves are aligned to the auxiliary circle, i.e. their straight shapes are bent to an arc of a circle (fig. 5). 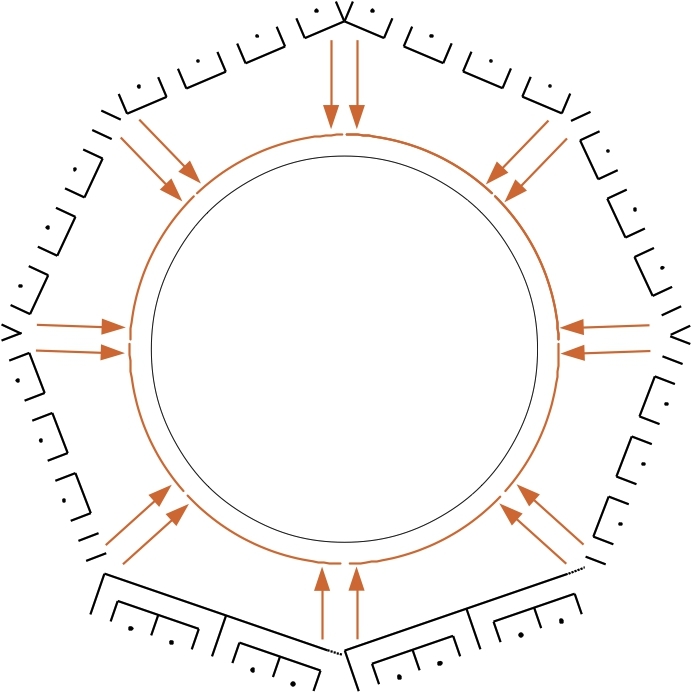 Note again that on the seed pattern of the main axis, two pieces of the central wall delimiting the pathway have to be added in order to complete the transformation into the circular form. This is only necessary in the main axis as on this axis the entrance to the labyrinth and the access to the center are situated. In the seed patterns of the side-arms there is no need for that. The result of the whole process is shown in fig. 6. A much larger auxiliary circle is needed, as not 2, but 8 halves of 4 seed patterns have to be bent over. The seed pattern of the main axis lies in the south quadrant. It has, similar with the seed pattern of the Heiric of Auxerre type labyrinth, 24 ends. The seed patterns of the left / upper / right side-arms lie in the west / north / east quadrants. These seed patterns all have two ends less than the seed pattern of the main axis, i.e. 22 ends each. 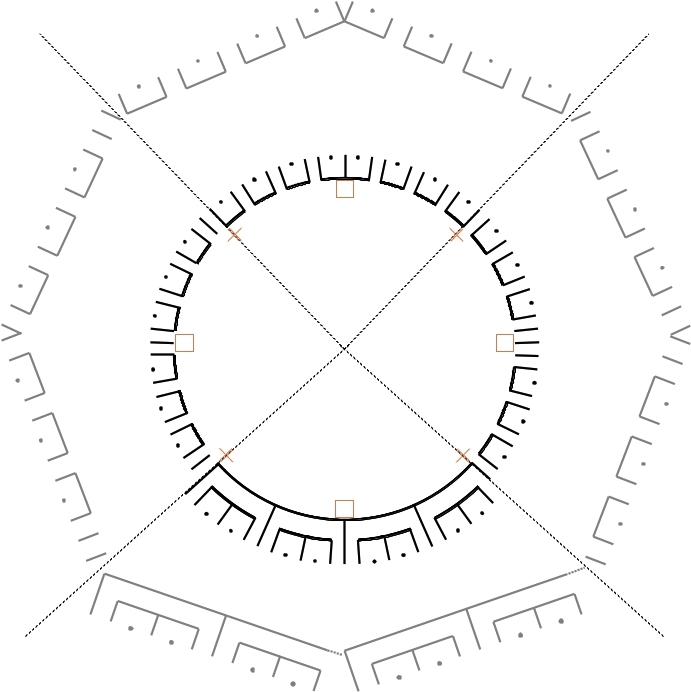 Thus, the number of spokes needed for the auxiliary figure of the Chartres type labyrinth in the MiM-style, can be calculated. It corresponds with the total number of all ends, i.e. 24 + 3*22 = 90 spokes. The former outer ends of the seed patterns lie now on the places marked with the small squares in south, north, and slightly above the horizon in east and west. At these places, in each seed pattern its two own halves are connected to each other. The former inner ends of the seed patterns, however, connect with the inner ends of each neigbouring seed pattern. These connections are situated at the places marked with dashed lines. One more thing remains to be noted. The inner arc of the circle of the seed pattern of the main axis is formed by an uninterrupted line. This represents the central wall delimiting the pathway. The labyrinths of the Heiric of Auxerre type as well as of the Chartres type are alternating labyrinths. This means, the pathway doesn’t traverse the axis (type Heiric of Auxerre) / main axis (type Chartres). This is different in the side-arms. The pathway always has to traverse a side-arm somehow. Otherwise it would not be possible to design labyrinths with multiple arms at all. The places where the pathway traverses the side-arms are clearly recognizable as gaps where the inner circular line is interrupted. What this implies for the design of the labyrinth will be shown in the next post.